This is an odd time of the year in the vegetable garden – spring is here but many of the veg we associate with the season (apart from heavenly asparagus) haven’t put in an appearance yet. Well, they have in the shops, just not on our patch. This Hunger Gap, as it used to be known, is no longer an issue when you can buy fresh vegetables all year round and when so many of us have freezers for summer surplus and emergencies. But if you try to be at least partially self-sufficient it can be frustrating to see chefs merrily cooking up food you know won’t grow in your own garden for at least another month. These recipes came from what we do have available, which includes some bolting cabbages. I was looking at recipes for cime de rapa and thought I could use the nascent flower heads of the cabbages in a similar way. They were delicious. 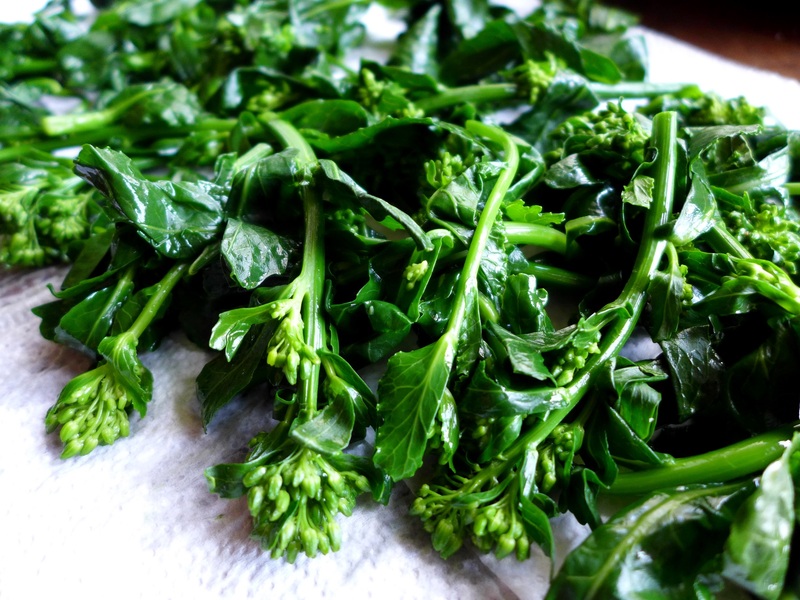 You can use broccoli such as purple sprouting or Tenderstem instead if, as I’m sure you are, you are a better gardener than me and ate your greens before they went to seed. Or of course if you have a handy greengrocer nearby. Bring a large pan of water to the boil and blanch the sprouting cabbage stems or broccoli for about two minutes. Remove to a sieve and run cold water over them to arrest cooking and retain the brilliant green colour. Drain well and lay them on kitchen towel to dry. Heat some good olive oil in a pan, add finely sliced garlic and a few chilli flakes to taste (I used Turkish pul biber aka Aleppo pepper but any fresh or dried chilli works) and cook gently for a minute or so, being careful not to burn the garlic. 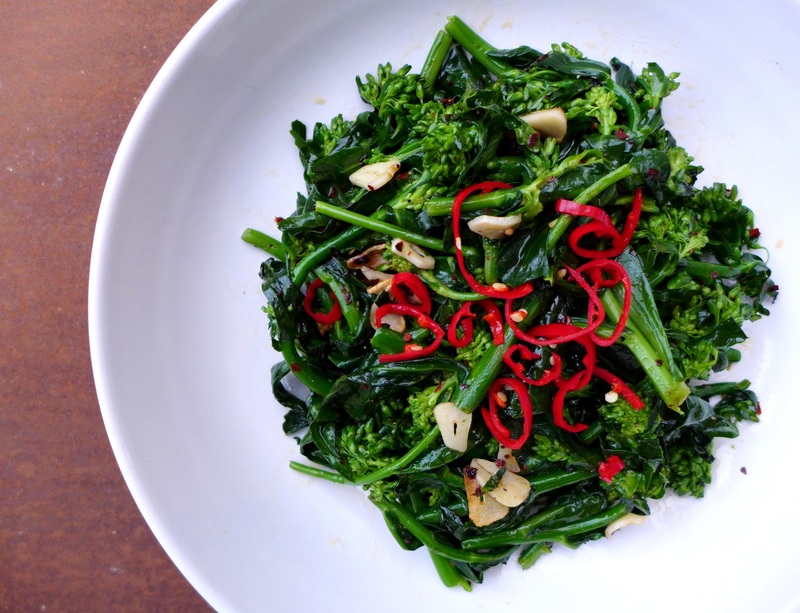 If you prefer, you can fish out the garlic once it has flavoured the oil and add the chilli with the greens. Either way, toss the greens in the oil until heated through and tender-crisp, seasoning with salt and freshly ground black pepper. Squeeze over a spritz of lemon juice, scatter with sliced fresh red chilli if you fancy the extra buzz, and serve warm as a side dish. The second recipe is just the first scant picking of asparagus spears combined with some baby broad beans and pesto from the freezer. I’m not sure how the pair of them managed to hide away in there for so long, but we did have a healthy harvest of both beans and basil last year. A judicious amount of wild garlic pesto would be a great alternative if you have it. Pesto from a jar, not so much, sorry. Try your local deli. Some milky ricotta is a good foil for the sweet vegetables and pungent pesto. Bring a pan of water to the boil and blanch the broad beans for two minutes. Remove (keep the water boiling) and place in a sieve, again running cold water over them to arrest cooking. Drain, and if the skins are tough and grey, double pod them by nicking with your fingernail and popping out the bright green beans. Set aside while you blanch the asparagus in the same pan for the same length of time, again running it under cold water. Drain both beans and asparagus thoroughly and allow to cool. Thin the pesto, if necessary, with a little extra virgin olive oil. 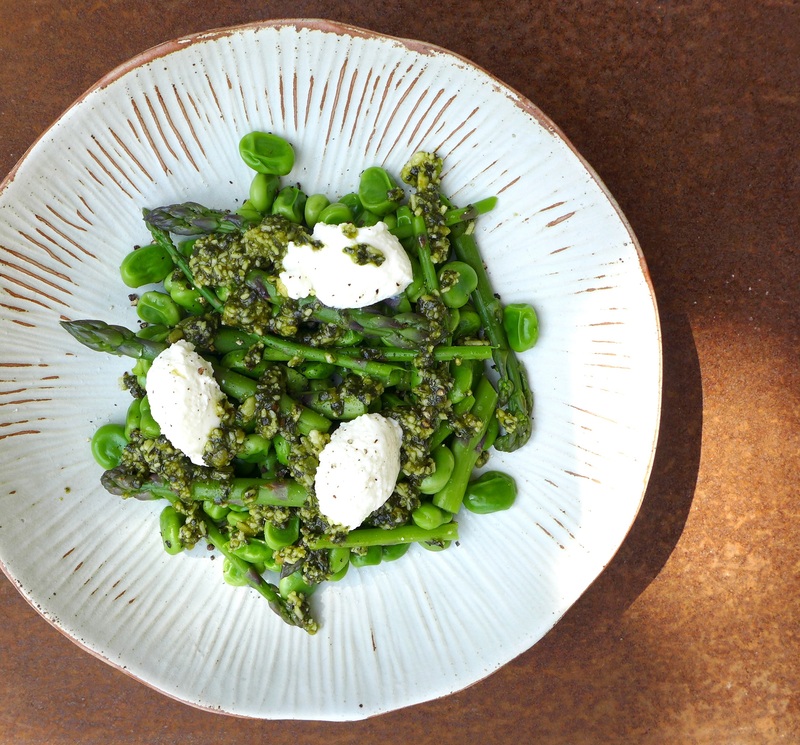 Place the beans and asparagus in a bowl, season lightly and drizzle with the pesto, adding a few spoons of ricotta if you have it and if you eat dairy. A lovely light lunch or starter. This entry was posted in In the garden, Vegetables and salads, Vegetarian and tagged asparagus and broad beans with pesto and ricotta, cabbage flower sprouts with chilli and garlic; broccoli with chilli and garlic, cima de rapa, eat your greens, spring vegetables by Linda Duffin. Bookmark the permalink. You’re so lucky to have a vegetable garden! Our backyard is just too shady for growing anything more than a few tomatoes in a planter… 😦 Thank goodness our local farmers market is opening for the season this weekend! (apart from some rare super greengrocer, like Puntarelle and Co in south London). it has been too wet and cold. At my local good greengrocer I see Italian peas and broadbeans, but I am resisting them. I found good English spring leeks and some English (french) Ratte potatoes (a contradiction, I know) and very good sprouting broccoli. All in all, rather boring..
It’s not always easy, eating seasonally! Here’s hoping the asparagus hits the shops near you soon. The growers are saying it’s at least two weeks behind. Nice to have home-grown greens ! Your salads looks so fresh and wholesome ! !